1 of 4 In a small bowl, whisk eggs, egg whites, chives, heavy cream, salt, pepper and nutmeg. Set aside. 2 of 4 Heat a 10-inch skillet over medium heat. Cook bacon for about 5 minutes, or until crisp. Remove from skillet and drain on a paper towel-lined plate. Remove drippings from pan and set aside. Wipe out pan with a paper towel. 3 of 4 Place skillet back over medium heat and add about 1 teaspoon of bacon drippings. When pan is hot, pour in a generous 2/3 cup of egg mixture. Sprinkle a quarter of the bacon pieces and 1 tablespoon goat cheese down the left side of the egg mixture. Cook for 1 minute. Using a rubber spatula, fold right side of omelet over bacon and cheese filling. Cook for 30 more seconds. Carefully slide onto plate (keep warm while cooking others). Repeat procedure for 4 omelets total. 4 of 4 In a medium-size bowl, toss salad greens with vinaigrette until evenly coated. 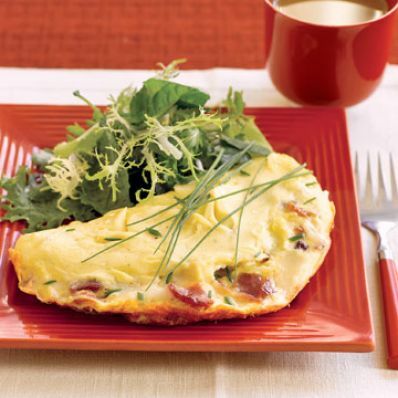 Serve alongside omelets. Per Serving: 1 g fiber, 630 mg sodium, 6 g carb., 20 g Fat, total, 237 mg chol., 8 g sat. fat, 282 kcal cal., 17 g pro.